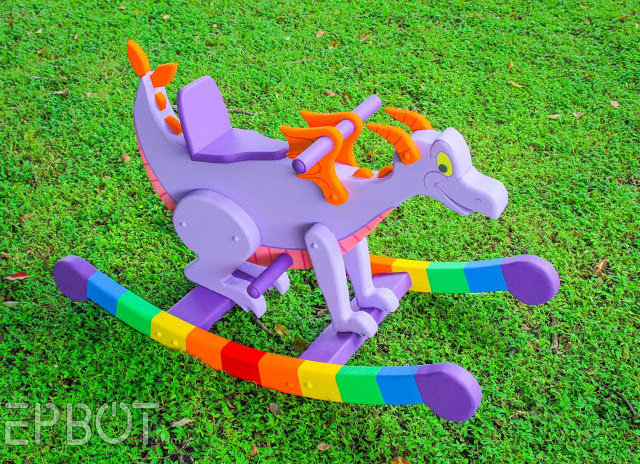 EPBOT: Our Figment Rocker Plans Are Finally Here! We later donated it to Give Kids The World, where it lives in a playroom on property. Since we put so much work into it - and enough of you expressed interest - John and I've been working to make a printable template to sell on Etsy, just like we did for our AT-AT. To do that we had to build another rocker, though; our Figgy was a little too small, and the template wasn't perfect. So John took our original rough paper templates, scanned them, smoothed out the imperfections in Illustrator, and up-sized everything by about 15%. He also simplified the design a bit, to make assembly easier. Then we began the tedious task of making another dragon rocker from scratch, and photographing the whole process for the instruction manual. This would be super cute for medieval or fantasy themes, or even dinosaurs if you take the wings and horns off (Stegosaurus, anyone? :D) I'm also hoping someone makes one in pink, because how cute would a pink dragon be. The only noticeable difference construction-wise is this new design only uses 2 layers of MDF for the body instead of 3. That makes construction much easier, while still being just as strong and cute. Also like the AT-AT rocker, we've formatted the template so you can print it on your home computer; you just tape the pages together and cut everything out. As for difficulty level, if you're comfortable with a jigsaw and a power drill, then this is in your skill set. The step-by-step instructions are filled with pictures and diagrams, and are written at a beginner's level. (I can say that because *I* understood them well enough to write them.) If you hit a snag, though, John's e-mail address is right there in the download, and he's great at walking people through trouble-shooting. Right! That's enough sales pitch. If you'd like the template and instructions - all 39 pages of them - then you can grab the digital download in my Etsy shop for $20. 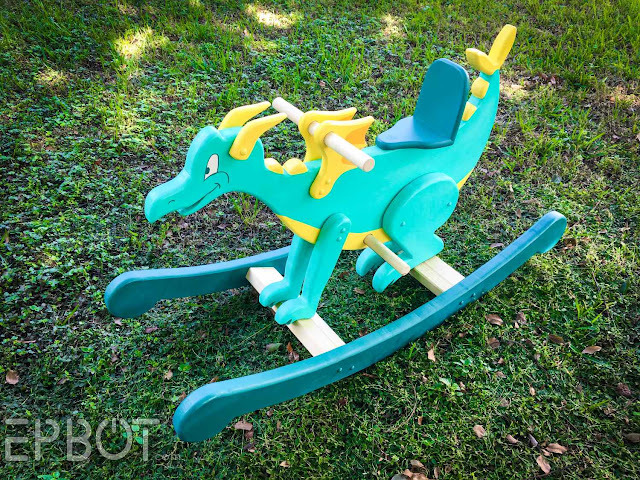 Maybe building your own dragon rocker is a little too daunting right now, but you still want one. Well, as circumstances would have it, we happen to have ANOTHER dragon rocker we don't plan to keep. This one. So, er... any of you want it? If so, and if you're local to Orlando (or willing to travel or pay for what I can only assume will be extremely expensive shipping), then comment below! Tell me who you want the rocker for, or what kids' room theme it's going in, and I'll pick my favorite to win this one. I'll announce the winner in my very next post, so remember to check back! I am no where near Orlando (Canadian FOE here!!!) but I want to say good luck to whoever wins this fantastic prize! Happy belated, John. I'm literally having twins tomorrow and this could be an INCREDIBLE addition to their nerdy nursery. 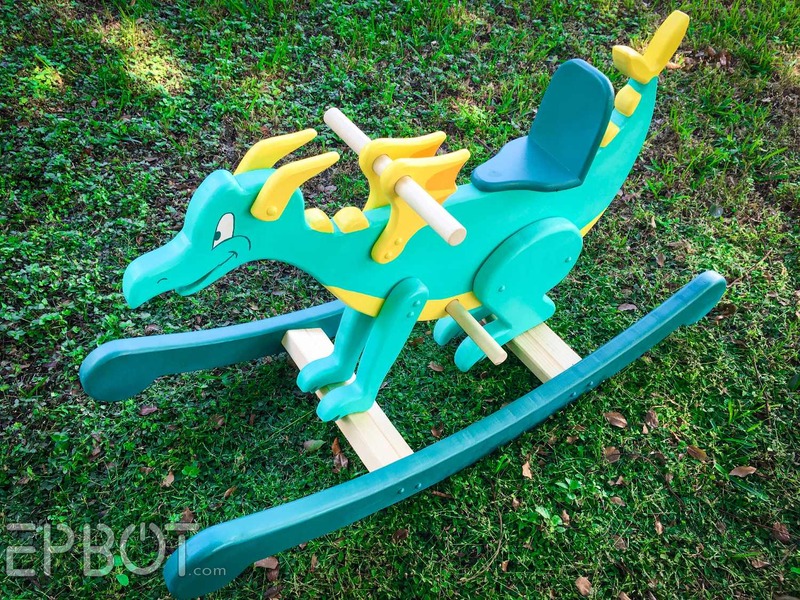 And what little would not love to ride a dragon?! Also, I'm not local to Orlando but shipping is a thing and I'm game for it! Wow twins- what a very special blessing for your family! It would brighten the day for the kids and families who are staying at the house. I would be very happy to pick up the rocker from you guys as I'm not all that far away. These are GORGEOUS! You are such an awesome duo. 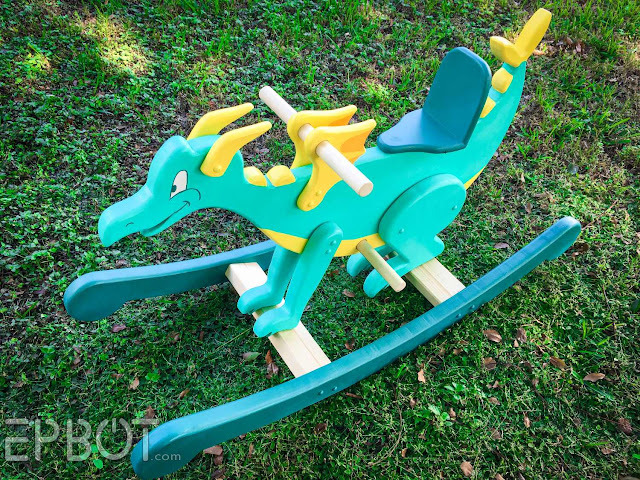 I would totally love this for my nerdy little 2 year old son and my nieces. Your posts always make me smile. I love it! I live in Tampa, so just a short drive to your neck of the hot, muggy, Florida woods. I would love to put this in my kiddos room, or our living room where a lot of his toys end up anyway. His room is teal with orange curtains, lots of tsum tsums, books, and many other Disney items. He is almost 14 months old and we have been trying to find the perfect rocking creature for him. I just might have to commission his papa to build this or the AT-AT for Christmas. I live right by Disney and would gladly pick it up! I have 2 kids - Jaina (yes, after Proudmoore! ), who's 4, and Gabriel (my husband wanted us to name him Thrall...I said maybe as a middle name, lol! ), who's 2. The dragon would live in our front room, which is where our computers and my art desk are! We have shelves filled with faeries and She-Ra dolls and my monster dolls that I made, Wonder Woman and friends, and other assorted figures. We have a big stuffed dragon on the floor. Art I've made covers the walls, as well as my Dragon Con lanyards from when we used to go every year (I was even proposed to at Dragon Con, at the old MMO party!) There's a little circus tent in the corner that closes so when my kids need quiet time, they can go in there :) The walls are green and teal, and the dragon would match perfectly! Sigh... you had me until "shipping". Unless someone wants to pay the shipping for me if I win, I'm out of the contest. Was planning on it going to Cincinnati's Ronald McDonald House, a place that has taken very good care of us on our trips there with my youngest daughter. To the winner - May he fill you house with magic and love!! He looks like he's got lots to give. This is so lovely, you guys always do such a great job. My son Noah would really love this. We're a new family who are just starting out our lives, so we're in the process of still making a home. Noah has a few toys but nothing to this extent. His room isn't decorate yet, but will me eventually. He's one years old and is constantly trying to ride our dog, so I'm sure he'd love something he could actually ride. We just moved from FL to NY due to my husbands military career, but we still have family in Orlando who would be more than willing to hold it for us until we're there again in December. I just had a son in June. As a former cast member, with a husband who is still cast member, our house is very Disney. Our son's nursery is Up! themed BUT he also has a ton of dragon toys because we also love the renaissance fair! We are BIG nerds! PS these are beautiful and congrats to whomeber wins! Awwww. After being in care for nearly his entire life, my daughter and son-in-law are about to finalize the adoption of their medically fragile foster son. We are beyond the moon excited for this to happen, and what a great "gotcha" gift this would be! Don't live local, but would gladly pay the shipping - dreams only come true once in a while, you know! I’ll be in Orlando in two weeks. My son’s room is Star Wars but we are huge Disney fans in this house. My dayghter’s room is Alice in Wonderland. . I'm not local, but I would pay for shipping! This will go in my daughter's room (she's 19 months) for a bit of fun and cute pictures. I work for the US Embassy in Mexico City (though you would only need to ship to TX and we'll take it from there) and I would love to give something like this to our med unit or family office to give something for incoming families somewhere to take their children and something to do (we have tons and tons of meetings our first days). I'm not local, but I might be able to swing shipping! It's so cute! I am just bummed that you did not make it in a grown up size! At 5'9", I think I am a little big for the one you made! Otherwise I would totally want it. I am so happy that the first one was donated to Give Kids the World. What an awesome gift for an awesome organization. This would be amazing in my daughter's Rapunzel room - I know Rapunzel doesn't have a dragon in it but what story is complete with out one? I'm driving down to Orlando from New Hampshire next week, so it would be amazing timing! You and John do amazing work! I am semi-local and go to Orlando often. I teach at Wildwood Elementary School in Sumter County. I have 7 students grades Pre-K to 5 grade and 6 of them have been diagnosed with Autism at the lower end of the spectrum. Most of my students are non-verbal and we are working on a lot of life skills. I know for a fact that 3 of my students would just have giggle fits if they were riding this. 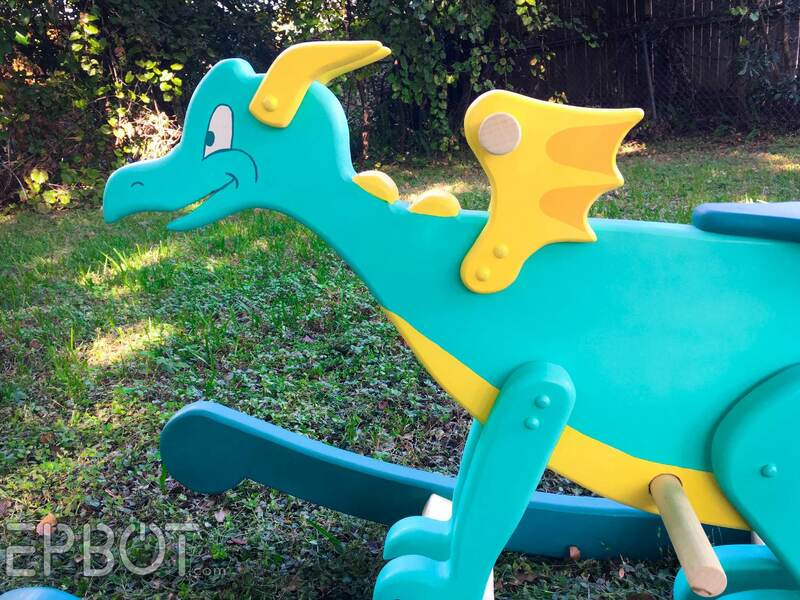 They love rocking chairs of all sizes and I could see them just falling in love with this cute dragon. I’m within driving distance and my newborn niece will love this when she’s bigger! I would love to have this for my kids (ages 0 and 5). My dad has worked at Disney most of my life and I spent a ton of time here growing up. This was my favorite EPCOT ride as a child and I still love Figment! Some people might say I love the ride a bit too much because I married myself a Disney mechanic and this is his main ride that he works on �� It would be nice to have a piece of Daddy's work at home with us. We are local so could definitely pick up. I live in Tucson, AZ but depending on the cost of shipping, this might be completely worth it for a close friend of mine. She's having a girl in January, and they love fantasy and dragons, and that blue is part of her theme for the nursery. It would be so perfect! I live in Melbourne but travel to Orlando regularly as there is nothing fun to do here. I have been reading CW and Epbot for years and through this blog I have learned how to get in touch with my geeky side, a side I never even knew I had or was brave enough to acknowledge until the last couple of years. I have been trying to work up the nerve to do a meet-up with you at the park but while I wouldn't go so far as to say I am a completely awkward person, I have let awkwardness keep me from hitting you up. Picking up the rocker would be a perfect, and completely non-awkward excuse to meet you in person and say thank you for the wonderful work you do and all the inspirational things you write on your blog. 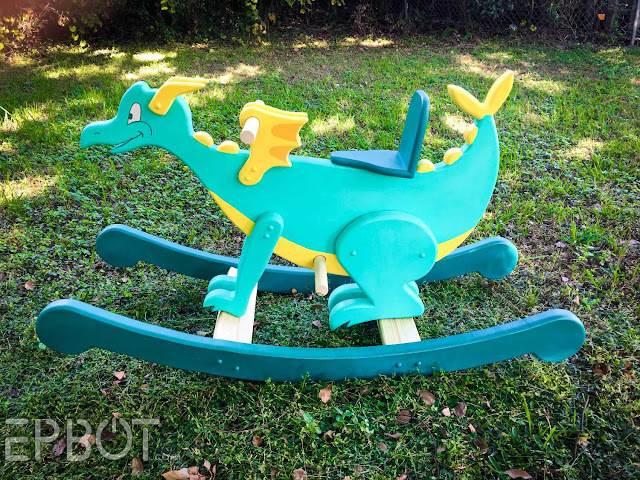 My kids are grown now but I have a Dizgeek friend with a toddler girl who would love the heck out of the rocker. Oh my, good luck choosing, Jen! So many worthy entries! I live in the Orlando area. This would be a great 1st birthday gift for my friend's 8 month old son. They have a Woodland Creature/Dinosaur themed nursery. Not in the Orlando area but I'd pay for s&h and such, it'd be for my boss/friend who had twins that turn one this month. Seems like just yesterday that they were little babies now they are one! I am on Orlando and a huge figment fan. My parents love telling the story of how my first trip to Epcot ending with me grabbing on to the gate yelling that I didn't want to leave figment. Now I have a 2 year old daughter and a baby boy on the way. Trying to pass on the figment tradition to them. 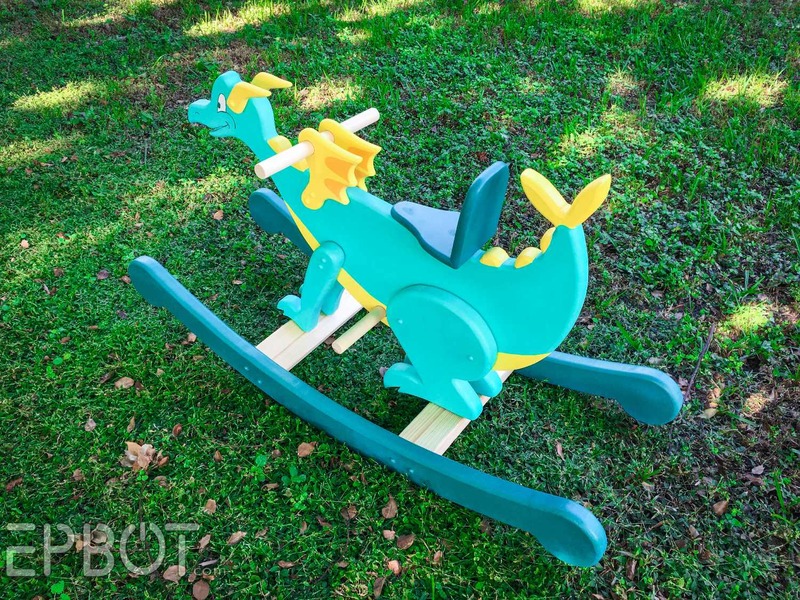 This rocker would look great with their other figment toys. Thanks for considering me. If it could come apart for shipping, I am game. I have a one and a half year old would would love it. We have a Pooh themed room but that isn't stopping me. P.S. that staypuff marshmallow man is still available local to me. My baby is still 16 weeks away from being done cooking! 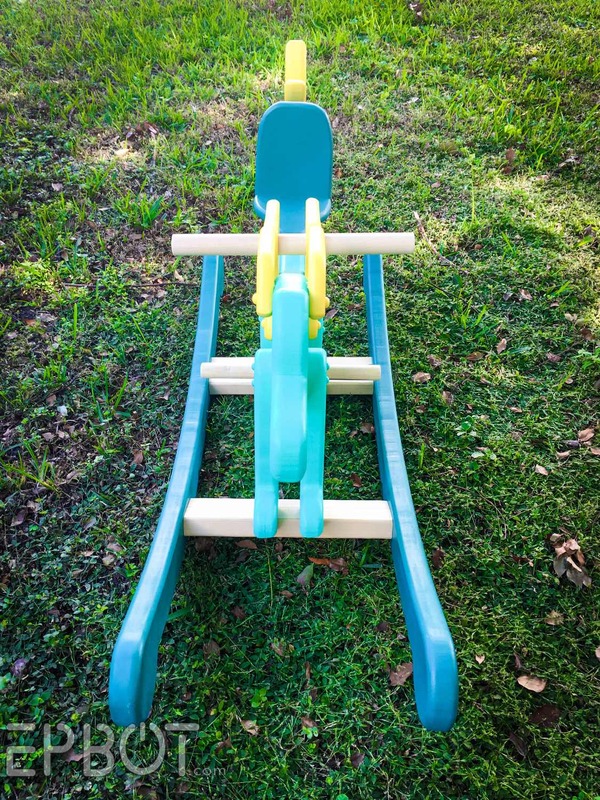 Between the year or two it would take for the baby to grow enough to enjoy it & the distance I'm just going to congratulate the winner & probably see if I can learn woodworking well enough to finish it for them when they are a toddler. So cute though!! I would totally pay for shipping as this would be the perfect baby present for friends of mine who just got married on Halloween (in a cornfield, naturally), dressed as Jack the Pumpkin King. My sister is having a baby and this would be ADORABlE for my incoming little punk princess's room - I live in Washington DC, but am in Florida on the regular b/c my inlaws live there. Whoops, sorry about that! Fixed now.